Right before the start of Sunday night’s Oscars, Selma director Ava DuVernay proved once again that something magical happened during the making of the best-picture-nominated movie. 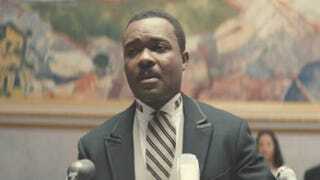 With one simple tweet, DuVernay captured what many people felt about David Oyelowo’s performance as Martin Luther King Jr. Although Oyelowo did not receive the best actor nomination, DuVernay made it quite clear: He was her best actor. DuVernay’s clip included an outtake of Oyelowo during the wrap of the film. In the clip, as the scene wraps, Oyelowo breaks down in tears and DuVernay rushes to the set to embrace him. The clip embodies the hard work DuVernay and her cast put into making Selma. Regardless of the nominations, regardless of whether some voters in the Academy of Motion Picture Arts and Sciences thought the movie lacked “art,” this movie had an impact on many lives and will go down in history.